An excellent and exciting read from beginning to end, I couldn’t put this down. I felt as if I was a silent participant in Grandpa’s ‘Liars Club. Love this tale written in RJ Smith’s youth. Great characters, suspense, and the visual… Wow! No spoilers, but you don’t want to miss the ending. The Storyteller is a definite winner in my book. Of course, as a fan and editor, I am biased. Wow! What a great unsettling short story Grandpa can tell! It’s visual, intense and so well-written that you have one choice to make: keep reading and grip tightly or look around you and make sure you remain safe from a curse. 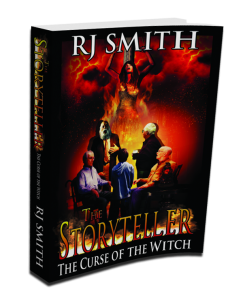 Simply fabulous from an outstanding author, RJ Smith. Love, love, love all of his books. 4.0 out of 5 stars -It is true what they say about what comes in little packages! What a fun afternoon read! I enjoyed this short so much I was putting up a finger and saying shush to my kids AND husband. The only way I can describe this short is that’s it has the same feel as reading Poe only sans the poetry. Smith pulls his readers through this short by their necklines and by the end I was actually on the edge of my seat, back hunched over my kindle. My husband said he kept expecting me to get up and jump across the room. This is the best 2.99 I’ve spent in my life!